The boys and girls of Portlaw N.S. have a long and proud involvement in Cumann na mBunscol activities and competitions. The girls had wonderful wins in INTO mini- sevens camogie and Gaelic football and the Roinn ‘A’ camogie in 2004-2005. In recent years our girls have performed very well especially in reaching the Eastern Roinn ‘A’ camogie final in 2009. Mrs. Siobhan Boylan has put in a lot of work with the girls in both camogie and Gaelic football and this has been seen in the performances of the girls as they have consistently punched above their weight with their performances in the Roinn A camogie and Gaelic football competitions. Emily White and Ciara O’Connor both represented the school in the primary game camogie. There has been a definite revival in the boys’ sporting fortunes in recent years. 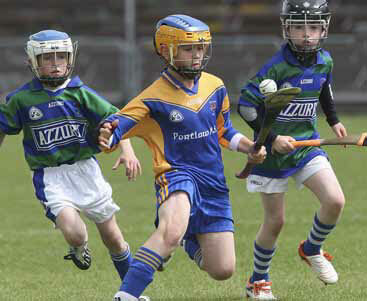 Jordan Harte and Luke Power have represented the school in the primary game hurling. Competitions won include the Eastern U-11 B hurling (2009), the Eastern mini-sevens hurling (2010) and the Eastern U-12 Gaelic football (2010). With all this silverware, it may come as a surprise to some that our proudest moments would be associated with our recent U-13 Roinn ‘A’ hurling campaign. Our boys played some wonderful hurling in their wins over St. Declan’s and Ballygunner but saved their best for what was a truly thrilling final. Unfortunately, we lost by a goal to an excellent St. Stephen De La Salle side. Hurling and camogie in particular, have become a way of life in our school. The children play almost every lunch time. When they go home they play at home with their friends and with their club. Gaelic games provide the whole community with a vital and vibrant common bond.